← Check out the Gallery! I recently read an article on Facebook on why white women still support the GOP despite the controversy over Kavanaugh’s nomination to the Supreme Court. It talked about their firm belief in a two-gender system, male superiority, what some term chauvinism or patriarchy. I would hazard a guess that their definition of virtue included patriarchal beliefs such as women should be seen and not heard, a wife is there to serve her husband, and that men know more what women need than a woman does. It is hard to argue with them and get them to see a different view – they feel secure in their superiority of virtue. Our language is binary in nature – the term ‘up’ includes ‘not down’ and ‘black’ indicates ‘not white.’ An unspoken, opposite is implied. Using the word virtue to define themselves, implies that everyone not “like them” are somehow un-virtuous. The women of the GOP aren’t actively saying this – they don’t need to. Our binary language says it for them. Why should I be labeled by how they define virtue or non-virtue, as the case may be? Is their definition of virtue even true? I know their definition isn’t true for me. Left unexamined it remains the standard measure of society. Loyalty, honor, truth, integrity, virtue, grace, and courage are just a few of the values that need to be examined for outmoded definitions. Feminine, masculine and what it means to be a man or a woman – straight, gay or transgender also need to be assessed. The old definitions contain assumptions that no longer work, and may have never even been true. We, as a country need to take a deeper look at the fabric of the qualities, ideals, principles and values we have been living by now and into the future. We need to examine these threads for untruths, flaws and outdated definitions that hamper all of us. When these qualities go unchallenged, we are defined not only by the spoken, but also the unspoken/implied limits by default. 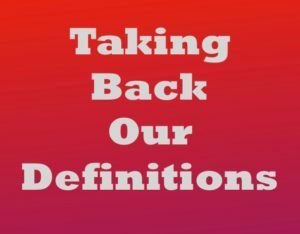 We need to start taking our definitions back. It’s like playing a game of baseball with broken bats, half the leather on the glove gone, chunks missing out of the ball, and crying foul on the other team. It is the equipment that isn’t working. These unexamined values keep us at each other’s throats. It may be time for a national debate. All sides may not agree on all the components that define these qualities, but hopefully there will be common ground where we can begin to build bridges. Mahalo Nicole, Good commentary… Reassesses perspective at a time where vigilant critical thinking is essential for change. Reflecting and redefining who we are rather than taking how we re defined as truth. Thought provoking. Thank you, Vima. Yes, I think we, as a country, need to slow down and being a self examination of our values. First, within ourselves, then amongst family and friends, and then out into our communities. It is sad that there is so much hate and bashing going on over ideals and values that, under examination, may no longer be valid.